"Many of us do think the president is unfit for office, but unless that’s a bipartisan conclusion, an impeachment would be doomed to failure." "A must read, Andy McCarthy’s column today, 'Dirty dealings of dirt devils who concocted Trump-Russia probe.' The greatest Scam in political history." "The baffling thing was why they were baffled. Barr's statement was accurate and supported by publicly known facts...."
Chuck Schumer in January 2017 — "prescient and important (and creepy)." "Well, I don't know if I received bad information, but I think I suspected that there was more than there actually was." "In Clinton v Jones, the United States Supreme Court held that separation of powers concerns did not preclude a federal lawsuit against a sitting President of the United States..."
"Former FBI lawyer Lisa Page admitted... that 'the FBI was ordered by the Obama DOJ not to consider charging Hillary Clinton for gross negligence in the handling of classified information'..."
"The best argument for impeachment is, ironically, the case for national unity. 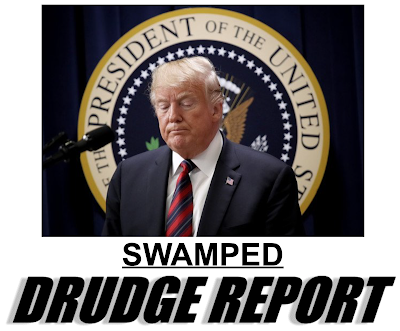 Americans ought to be able to agree..."
Trump is right where he wants to be at this time point in his narrative arc. Axelrod isn't quite saying it's a witch hunt, but it too easily plays into the "witch-hunt" meme. "Wow, just revealed that Michael Cohen wrote a 'love letter to Trump' manuscript for a new book that he was pushing." 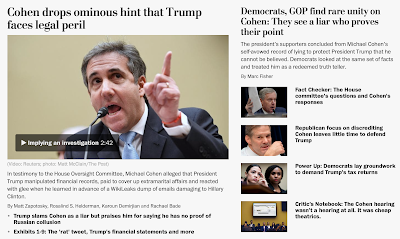 "Democrats, GOP find rare unity on Cohen: They see a liar who proves their point"/"Mr. Cohen’s testimony may push each party further into its corner...."
"I am ashamed that I chose to take part in concealing Mr. Trump’s illicit acts rather than listening to my own conscience." "The [Mueller] report is unlikely to be a dictionary-thick tome, which will disappoint some observers. But such brevity is not necessarily good news for the president." "I just want to remind you that that mildly nauseous feeling you have is because for the last two years, Donald Trump has been spinning you in a tumble-dryer full of turd." Did you watch that McCabe thing on "60 Minutes"? "[Roger] Stone, a self-described dirty trickster who began his career as a campaign aide for Richard M. Nixon and has a tattoo of Nixon on his back..."
"Former FBI top lawyer James Baker just admitted involvement in FISA Warrant and further admitted there were IRREGULARITIES in the way the Russia probe was handled." "BuzzFeed's report... as written, was as clean as it gets: Trump directed Cohen to lie about the Trump Tower in Moscow project, and there’s tons of evidence to support that." "They got caught spying on my campaign and then called it an investigation" is a great line. "What if there were no collusion or conspiracy but simple cognitive bias on both sides, where the actions of one seemed to confirm precisely the suspicions of the other?" "The Fakes always like talking Chaos, there is NONE. In fact, there’s almost nobody in the W.H. 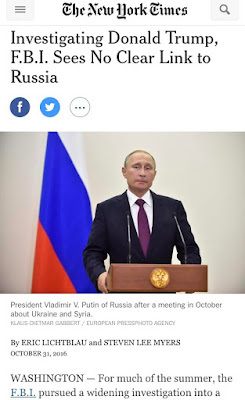 but me...."
"In the Russian Federation and in President Putin himself, you have an individual whose aim is to disrupt the Western alliance and whose aim is to make Western democracy more fractious..."
I didn't do it, but anyway, it's no big deal and Obama did it too. "Letitia James, a Democrat, has made no secret that she intends to use her powers as New York’s attorney general to pursue possible legal action against President Trump."